This undated photo from the Collection of Bob Graham shows Steam Engine #449 on the tracks beside Main Street in Pomeroy, Ohio. The trains stopped traveling along Main Street in Pomeroy in the mid-20th Century. 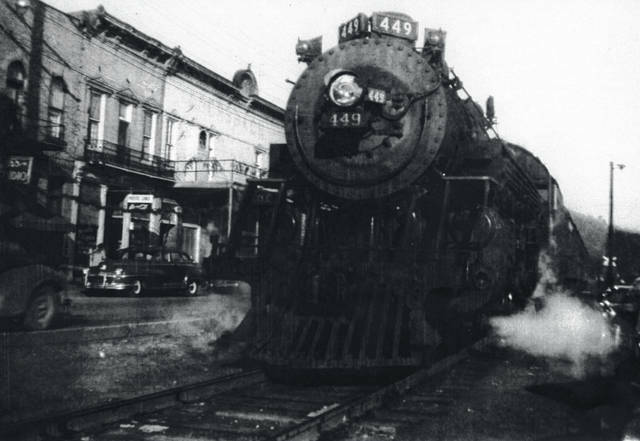 According to local historian Jordan Pickens, the last scheduled Chesapeake & Ohio passenger train made the run from Columbus to Pomeroy on Dec. 31, 1949, and the final passenger boarded the train at the Rutland depot on June 2, 1951, bringing an end to passenger train service in Meigs County. During the same time, diesel locomotives began to replace steam locomotives at Hobson Yards on the New York Central Railroad (formerly Kanawha & Michigan,) and employee layoffs soon began. Graham’s photos can be seen at the Meigs Museum or on the Meigs County District Public Library website.